SKU: PNJ09. Categories: Miscellaneous Wedding, Party & Event, Miscellaneous Party, Concession Equipment. Tag: Chocolate Fountain. 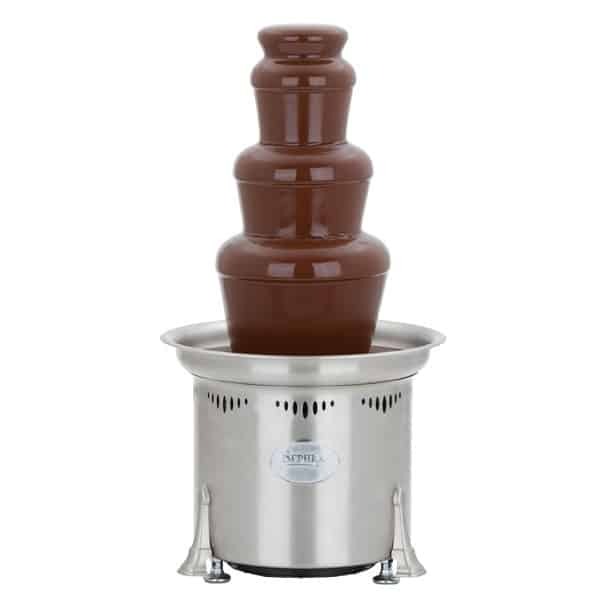 Thank you for renting your chocolate fountain from All Seasons Rent All. Please take the time to read these instructions so you may enjoy your event to the fullest. The chocolate must be purchased from us to avoid strain on the auger and motor. Extra product can be taken and returned if unopened and not damaged. Your fountain comes to you clean and ready for use. Ensure the fountain vent holes and bottom of the base housing are not covered. Check to see that the fountain basin (bowl) is securely tightened. Place the auger with the stabilizer (black plastic piece) into the cylinder and turn it clockwise to check that it is locked in place over the center square drive shaft. Place the crown on top of the cylinder. Preheat the basin for FIVE MINUTES ON SETTING 5 while heating the chocolate in the microwave according to the instructions on the bag of chocolate. Fill the basin of the fountain with at least 5 pounds of chocolate to get the fountain going. The basin will hold a maximum of 7 pounds of chocolate at a time. Press the toggle switch to START. The auger will begin carrying chocolate up through the cylinder. As the cylinder fills with chocolate, there may be a brief knocking noise which will stop once the entire auger is coated in chocolate. When you are finished, simply use a rubber spatula to remove as much excess chocolate as possible from the basin, cover the fountain with the included plastic bag, and return to us. All Seasons Rent All will clean the fountain. Do not immerse the fountain in water. There will be a minimum additional cleaning charge if the fountain is returned with excessive chocolate.